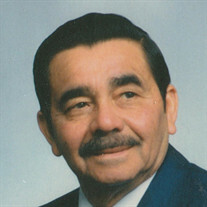 Angel Luis "Chorty" Arocho, 91, of Lorain, passed away Thursday, June 1, 2017 at New Life Hospice Residential Center, Lorain, following a short illness. Born July 5, 1925 in Utuado, Puerto Rico, he came to Lorain in 1948. Angel worked for 37 years at Lorain Works US Steel in the Open Hearth, retiring in 1983. He was a member of Templo Emmanuel Assembly of God, Lorain, and the United Steel Workers Union Local 1104. He enjoyed gardening and his music and especially loved growing roses and spending time with family. Surviving are his sons, Luis (Joanne) and Edwin Sr. (Rose) both of Lorain; a daughter, Nellie (Jose) Arocho-Rivera of Lorain; 7 grandchildren and 15 great grandchildren and 1 great great-grandson; brothers, Antonio of Rio Piedras, Puerto Rico; sisters, Geno Boneta of Vero Beach, Florida, Emyne Berrios of Atlanta, Georgia, Aida Martinez of Lorain, Rosemary Bibler of Cleveland. He was preceded in death by his wife of 53 years, Lydia (nee Vargus); brothers, Ernesto, Ermelindo and Jose; and sisters, Elsa Gonzalez and Irma Silva. The family will receive friends on Tuesday from 4:00 - 8:00 pm at Templo Emmanuel Assembly of God, 4230 Clinton Avenue, Lorain, where funeral services will be Wednesday at 10:00 am. Rev. Pedro Negron, pastor will officiate. Burial will follow in Calvary Cemetery, Lorain. The Dovin Funeral and Cremations Specialist, 2701 Elyria Avenue, Lorain, is handling the arrangements. To send online condolences go to www.dovinfcs.com.